Hello, my name is James and I am the Branch Manager for the Manchester Central branch where today I can offer some of the best prices on car rental in Manchester city centre. We have a superb range of vehicles all ready for collection and if you book direct with us online at our official website we can guarantee you the cheapest prices from Easirent. Arriving at Manchester by air, if you wish to use our Manchester Airport branch please click here. Arriving at Manchester by train. Our branch is a 10 minute walk from Piccadilly station. After exiting the station, walk south-west on Ducie Street towards Station Approach. Turn right onto the A6, left onto Portland Street then take the slight right turn on to Portland Street. After 500 feet, take the slight right onto New York Street, continue onto York Street and after 230 feet turn left on to Fountain Street (125ft) – our branch is on the left hand side. Arriving at Manchester by bus. Take the Metroshuttle 3 from the station and exit at Charlotte Street/Chinatown stop. From there, walk north west on to Charlotte Street and then a right turn on to Fountain Street – you will see our office on the right. Dropping off your car at Easirent Manchester City. Our branch is a 20 minute drive from Manchester airport, from the M56 head to Medlock Street/A5103 to Manchester (8 miles). Continue on the A5103 for just over a mile then take the 2nd exit on to Medlock Street, continue for 0.4 miles then turn right onto Gt. Bridgewater St. Finally, after half a mile, turn left onto Charlotte Street, then a right turn onto Fountain Street. Our branch is on the left hand side. The biggest brands and major retailers can be found in the Trafford Centre – A huge shopping centre which contains lots of big name shops and brands. The Trafford centre also provides a range of restaurants as well as an 18 lane bowling alley and an Odeon Cinema. Manchester Piccadilly Station is the busiest of the stations in Manchester and is the sixth busiest in the UK. Outside London, it is the second busiest interchange station, with close to 3.8 million passengers changing trains at the station annually. 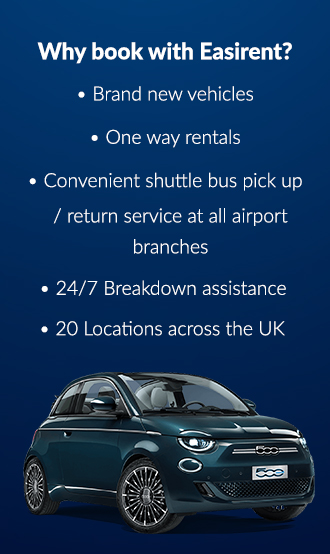 Hire a car from Manchester Airport, our nearest branch to Manchester city centre. The City of Manchester is the third most visited city in the UK behind London and Edinburgh. One of the main reasons for the high placing is the fact there is always something going on from an International festival, a Premiership football match or a well known musician performing at one of the many venues. Easirent’s Manchester City branch will pick you up and drop you off at Manchester Piccadilly Station, as it is located no more than a minute from the car hire building. Offering luxurious accommodation in a grade 2 listed building, it is just 100 metres from Manchester Piccadilly Station. The apartments are ideal for business, a weekend break or a stop over for a night out. Each is individually designed, with one or two bedroom, deluxe, family and penthouse apartments. Kitchens are fully equipped, flat screen TV with free view, wireless and fixed broadband, with an open plan interior. There is a security deposit required during check in, check with the hotel for rates, but is fully refundable on departure. A modern hotel offering single, double or twin rooms that have recently been refurbished, all of which are ensuite, quiet and comfortable. Only 400 metres from Piccadilly Train Station it is an ideal location for concert, exhibition or retail therapy. Also Manchester United and Manchester City football clubs are close for a match day experience or just a tour of the stadium. All rooms have Wi-Fi and are fully equipped. A multi story car park is adjacent, with competitive rates on 24 hour stay. There is a restaurant that serves through out the day and a bar open until late, plus 24 hour room service is available. In the heart of the city, amongst the retail area of the city, only minutes from Piccadilly station, it is a great choice to have as a base to unwind. Each room is individually designed offering CD player, satellite television all rooms are an oasis of calm. The Brasserie and bar offer great French food and drink and there is a mini spa available. Located in Piccadilly Gardens, extremely close to Piccadilly train station and shops and theatres plus the busy nightlife, the hotel offers five floors of accommodation. Superbly decorated all rooms offer private bathrooms, TV and hairdryer. A warm and friendly service is on offer and there is a restaurant, lounge, bar and meeting facilities all offering value for money. One of the big draws to Manchester from a sporting perspective is the two football teams in the city that compete in the top flight of English football. People from all over the world visit the city to watch Manchester United play at the theatre of dreams or to just take a tour of the ground to get a glimpse of one of the most successful clubs in English football. Manchester City is a more recent addition to the global football phenomenon after being bought and now have the millions to compete and attract the best players have made them a team for people to want to watch. Situated on the waterside at the heart of The Quays, The Lowry is a stunning, award winning building housing two vibrant theatres, a studio space, relaxing art galleries, cafés, bars, a restaurant, souvenir gift shop and Salford’s Tourist Information Centre. With a huge variety of performances, The Lowry’s Lyric and Quays Theatres offer a wealth of fabulous entertainment, including West End musicals, the very best in drama, live bands, famous comedians, plus world class dance and opera.Gallery entry is free and you can enjoy the work of one of the nation’s favourite artists, LS Lowry, in changing exhibitions of his work which we hope will offer some surprises. At the same time, experience work by artists of local, national and international renown to compliment our Lowry exhibitions. There’s always something new and refreshing to see in our galleries.With family fun throughout the building, guided tours, the Meet Mr Lowry film, plus participatory activity for all ages, The Lowry is a great day out. You don’t have to be in a large group to come and race we are open to the public. Stonerig raceway is an award winning venue where you will Experience the very best in scalextric racing you will not believe what you see, it really is an attraction well worth seeing, it is great for all ages, it really gets family competing together in a friendly,fun and competitive way. We have 5 massive full themed tracks and 1 hire track, so come and tack you’re position on the starting grid.